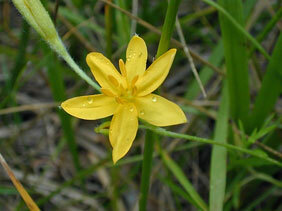 Stems: Flowering stems from solid bulb, slender, ascending to spreading, usually shorter than leaves, hairy. Leaves: Basal, grass-like; blades 3-6, linear, 2 to 12 inches long, to 1/4 inch wide, long-hairy. Inflorescences: Umbel, 2-14 flowered, ascending to spreading. Flowers: Golden yellow, 1/2 to 1 inch wide; perianth segments 6, stiffly spreading, partially united, each 1/4 to 1/2 inch long, 1/10 to 1/4 inch wide; outer surface greenish, pubescent; inner surface golden yellow; stamens 6, erect. Fruits: Capsule, small, oval, somewhat hairy; seeds several, rough, black. Habitat: Moist to dry prairies and occasionally open deciduous woods; often in soils with high lime content. Distribution: East 1/2 of Kansas. Uses: Native Americans used a tea made from stargrass as a heart medicine. Preparations made from the bulb-like root have been used to treat ulcers. Comments: The common name refers to the star-like flowers and grass-like leaves. Usually only one or two flowers open at a time.